First off, my flight here from Bangkok was pretty terrible and I do not recommend Bangkok Airlines or the Siem Reap airport, but you don't really have a choice with the latter. My plane was sitting on the tarmac with no explanation for at least 30 minutes (the flight is only an hour) and the air con vents in my row weren't working so I spent the flight fanning myself in vain with a safety instruction card but I still got pretty sweaty. The airline is also incredibly wasteful; it's completely unnecessary to give people a moist towelette before takeoff and a crappy in-flight meal (with no vegetarian option I might add) for barely a one hour flight. I was also slightly disappointed to receive American dollars when I withdrew money from the ATM. I quickly learned that it's the standard currency here (at least for tourists and travelers) but you can get some 100 and 1000 Cambodian riel notes here and there as change (instead of US coins). Admittedly I had very limited knowledge of Siem Reap and Cambodia for that matter when I first included it in my itinerary months ago. I thought Siem Reap was just a temple or two but it turns out there are 100 square kilometers of temples and other ancient ruins scattered around this area, which is unlike anything else I've ever seen. It's a UNESCO World Heritage site, brings in tourists by the busload and it's even part of their national flag. So the flag also kinda functions like a perpetual advertisement, reminding you of how awesome their ancient architecture is, and that you are missing out if you don't come see it! Brilliant. Seriously, Rome and Athens ain't got nothin' on Siem Reap. The main attraction of the Siem Reap temples is Angkor Wat itself, which translates to Capital Temple and is according to Wikipedia is the largest religious monument in the world. It was originally constructed as a Hindu temple dedicated to Vishnu during the reign of King Suryavarman II in the early 12th century but it soon transitioned to a Buddhist temple before the turn of the 13th century. It's surrounded by a large moat and is west-facing so the sunrises are supposed to be spectacular, but also super crowded with tourists, so I don't think it's worth getting up that early. As I walked up the first few steps toward the bridge, I was talked into renting a tour guide for $15 since I didn't do a ton of research in advance. He spoke decent English and gave me lots of great insight, but also walked me right through the mini market to the left of the temple where I was mobbed by merchants yelling at me to buy their stuff. Here are some of my humble pictures but there are way better ones online. I really liked the rather serene faces, or maybe it was several variations of the same face at this temple. 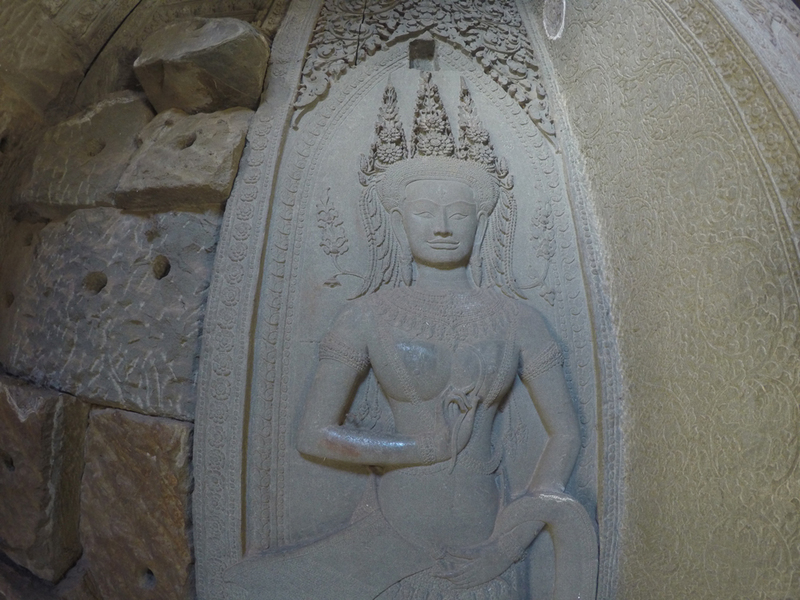 It was built by the Mahayana Buddhist King Jayavarman VII in the late 12th or early 13th century. The faces are thought to symbolize either the king himself or the bodhisattva of compassion. This one is your Hollywood-induced picture perfect image of what all ancient temples in forests in movies look like - except it's real life. It was built by the same King Jayavarman VII from Bayon and was meant to be a forest monastery and university for Mahayana Buddhist monks. I love how much nature has started reclaiming the temple ruins. It really inspires your imagination and makes you feel like Indiana Jones or Laura Croft, maybe because parts of the 2001 Tomb Raider movie starring Angeline Jolie were filmed here and no doubt inspired her to adopt her now 14-year-old Cambodian son Maddox in 2002. Tickets are pretty expensive and there's really no way to get around it because guards check your pass at every temple. A one day pass is $20, the three day, which I opted for, is $40 and a 7 day pass is $60 and you can only get them at this giant booth a few km south of Angkor Wat. Then there's the cost of transportation, either a bicycle, motorbike, tuk-tuk, car, mini-van or bus, except my bike was free to use from my hotel. There's the small loop which is relatively close together and includes the most famous sites of Angkor Wat, Bayon and Ta Prohm and a few other sites that are stoptional. No matter what time you go, these spots are always covered with tourists like ants swarming a lollipop. This is the area that I spent two days and over 100 km bicycling. I probably could have done it in a day if I didn't get lost a few times and if I didn't have to bike 10 km each way to and from my hotel. The big loop includes a bunch of other miscellaneous sites that are more spread out so I hired a tuk tuk driver for $20 for this. 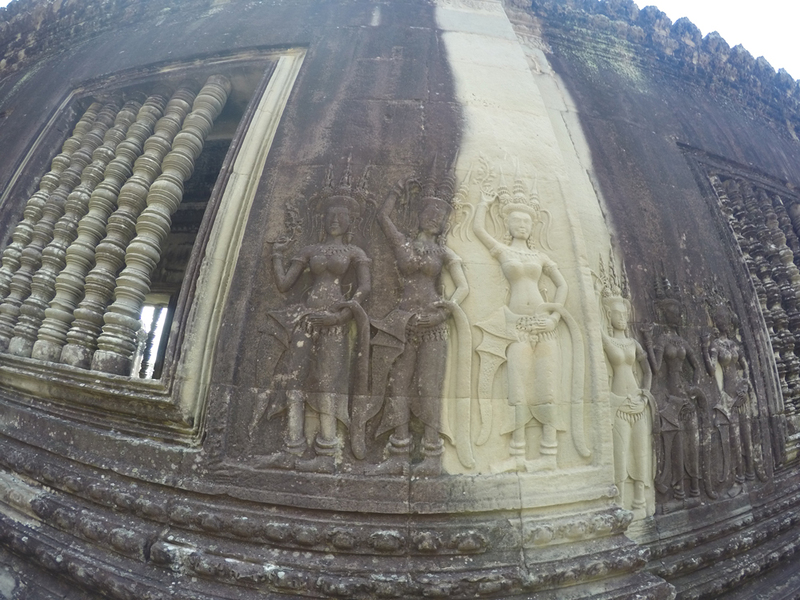 Not only do you see a few more temples, but you also see more authentic Cambodian culture and landscape. I loved buzzing by all the little villages and rice paddies. There are also a lot less tourists. The forecast is always hot with 100% chance of sweating so I am glad I wore my lightweight, quick dry synthetic trekking top and pants from REI. You should cover up shoulders, torsos and knees both to protect yourself from the sun and to be respectful of the people and places you are visiting. You will have local merchants and kids begging you to buy things at every single temple. Magnets, postcards, elephant pants, scarves, paintings, guidebooks, etc. The kids are the hardest to say no to, as they will always tell you that the money is for school, but they're most likely being exploited because they should actually be in school - not selling trinkets to tourists. More Advice on Trip Advisor.